Roll Play: Pilates practitioners find that elusive endorphic haze. A fitness program is useless unless it fits into your life. It's very unlikely that you will be able to keep yourself motivated if showing up for your exercise routine is as challenging as getting though the reps. When confronted with completing this little portion of the fitness issue, I was asked to contact Kathy Craft of Energetix Fitness to talk about her outdoor circuit training class. I did. We talked. Everything was grand . . . initially. We spoke about the effects of circuit training with its emphasis on keeping the heart rate high through a combination of cardiovascular and strength training exercises. We waxed poetic about the effects of negative ions in the atmosphere that counteract the effects of our lifestyles that leave us indoors for 90 percent of the time. We discussed how her training classes rotate through a series of local historical sites. My inner geek was rejoicing, so I casually inquired as to when I might be able to show up at a class. "We meet tomorrow morning on Highway 1 just outside the entrance to Wilder Ranch at 6 o'clock," she said. "Cool, I can go after work," I respond. Usually if I see 6am, it's from the other end of the sleep cycle. Six is an hour for bakers and fishermen, not musicians and writers. The best thing about my life right now is the fact that I wake up about 10 minutes before I have to roll into the office. Craft, her circuit training and Wilder Ranch were officially crossed off the calendar. The problem is that, like most reporters, I come with a good amount of inherent heliophobia. This is not to say that I am a lumpy barfly. I jog. I commute on a bike. I spent last weekend hiking. I love physical activity. It's the only thing that keeps me from turning into a mole. Left without a story (but still facing a deadline) I decided to try Pilates. Specifically I was going to try Yamuna body rolling combined with Pilates. So I gave Sandy Kruger a ring at TheraPilates. Pilates is a physical fitness method that was developed in the earlier part of the last century by Joseph Pilates. While serving as a medic for injured soldiers in Britain, he developed over 500 specific exercises that stressed muscle control, form and precision. One of his students took the method to Beverly Hills and convinced a few celebrities to give it a whirl, and the rest is calisthenics history. While often lumped in with that whole yoga thing, Pilates is an entirely different school of contortion. In Pilates, according to Kruger, "the motion is constant and the method is based on strengthening your core muscles by using your arms and legs as levers." It's a great workout for recovering after injuries and for general muscle relaxation. In fact, Kruger first began teaching Pilates after she suffered through a herniated disc and a wicked case of sciatica. "Pilates was the only thing that I could do that would let me be active," she says. 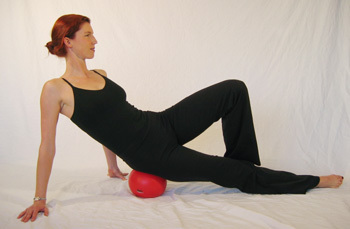 While physically challenging, the end result of Pilates is that "you teach your [body] how to hold itself in a new way. It changes the alignment of your spine, arms and legs." Best of all, according to Kruger, "anyone can learn." Though blessed with all the physical agility of an elephant seal, I found Yamuna body rolling to be enjoyable. Learning how to balance yourself on the sphere, you realize that this workout actually relaxes you at the same time that it moves your abs in directions that you've never thought possible. After just a few minutes of motion, your muscles are left slightly warm and fully relaxed. This comes from the ball gently rolling down the length of the muscle, a process that first tenses the fibers and then flattens them out before releasing them in an endorphic haze. This method of exercise is the perfect antidote to long bike rides, days in front of the computer or repetitive motion stress. Leaving the studio I felt taller and more relaxed for all the effort that I had exerted. Any way you slice it, it sure beat waking up at 5:30. Sandy Kruger teaches both Body Rolling and Pilates Mat Classes. More information about her classes can be found at www.therapilates.com or by calling 831.295.2780. Kathy Craft teaches outdoor circuit training. More information about her classes can be found at www.energetixfitness.com or by calling 831.588.4098. From the July 27-August 3, 2005 issue of Metro Santa Cruz.